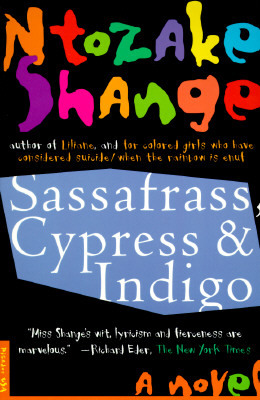 Sassafrass, Cypress and Indigo is the story of three "colored girls," three sisters and their mama from Charleston, South Carolina: Sassafrass, the oldest, a poet and a weaver like her mother, gone north to college, living with other artists in Los Angeles and trying to weave a life out of her work, her man, her memories and dreams; Cypress, the dancer,who leaves home to find new ways of moving and easing the contractions of her soul; Indigo, the youngest, still a child of Charleston—"too much of the south in her"—who lives in poetry, can talk to her dolls, and has a great gift of seeing the obvious magic of the world. Ntozake Shange is a renowned playwright, poet, and novelist. Her novels include" Betsey Brown" and "Liliane," both of which are available from Picador. She lives in Philadelphia with her family.